Groups is basically a subset of users that are enrolled in a course. Each group of users has its own workspace, where the member of the group can perform action privately of other students. Your instructor can create a group, place you or allow you to select the group you want to join and provide a number of tools. In the My Groups panel, you can see all the groups you are enrolled in and access any group tool just by clicking on it. File Exchange – All members, as well as your instructor, can add files. They can also delete files, regardless of who added them. Group Discussion Board -Users within the group can create and manage their own forums and discuss topics with just the group members. Group Blog -All course members can, read and comment on a group blog, but they cannot make posts unless they are members of the group. Your instructor can select the grade option for group blogs. Group Journal – All members of a group can view each group member entries, but the group journal can only be viewed by the group and your instructor. Group Task – Users within the group can create tasks that are distributed to all group members. Group Wiki – Users within the group can edit, and view their group wiki. Your instructor can view and edit a group wiki. Send Email – Users within the group can email the other members or the entire group. 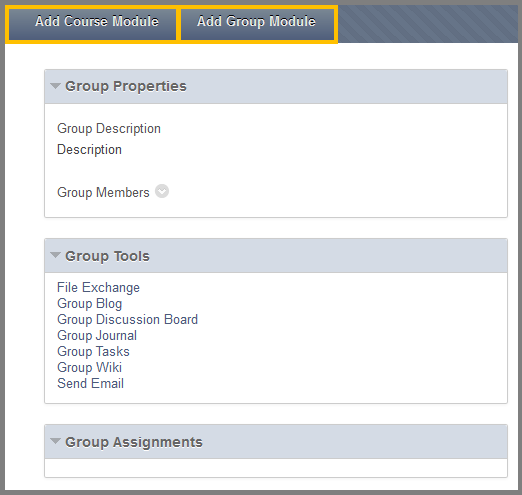 Add Course Module: By clicking this tab you can select which Course modules you can see when you enter the Groups page. 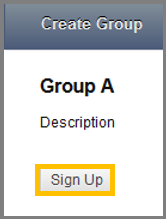 Add Group Module: By clicking this tab you can select which Group modules you can see when you enter the Groups page. Your instructor can make many groups available and allow you to choose the group you want to join or just place you into one. The instructor can make the names of the group members available in order to help you decide which group to sign-up to. 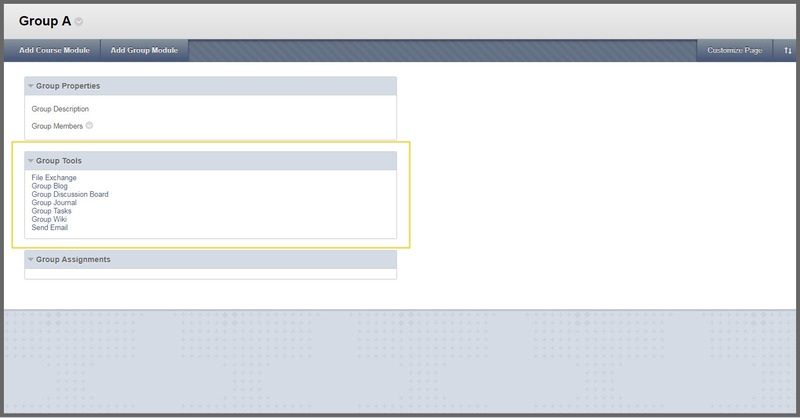 Also the instructor of your course chooses which tool the groups member can access. Navigate to the Groups page and click Sign-up to access the sign-up sheet. While inside the sign-up sheet, click the Sign-up button to join this group. If the instructor has allowed it, you are able to create a group. Click the Create Group button at the top of the screen. In the Create Group page, provide a name for your group and an optional description. 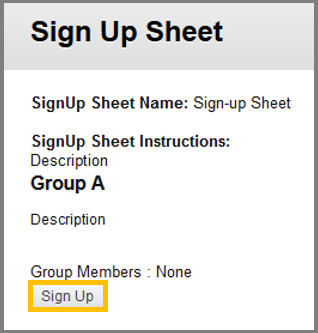 Provide a Name of Sign-up Sheet and an optional description. Type the Maximum Number of Members. Access the group you want and click the Send Email option. 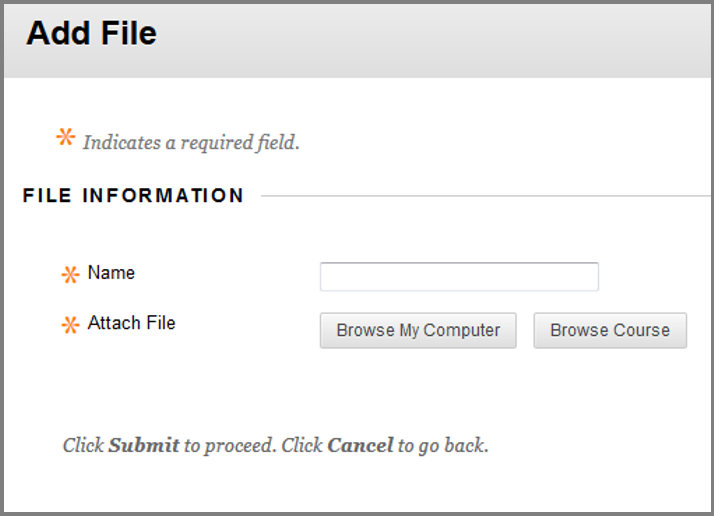 While inside the Send Email page, select the recipients of the email in the Available to Select box. Type a Message for your email. Click Attach a File if you want to include a file in your email. Access the group you want and click the File Exchange option. While inside the page, click Add File. While on the Add File page click the Browse My Computer to upload a file from your computer. You can either select the group assignment from a course menu item created by your instructor or you can click the name of the assignment inside the group. Review the instructions provided by your instructor. Download any files provided by your instructor. Optionally, you can type your comments.